Keyless Entry System Generation IV built for your Mercedes-Benz W126 CL-Class and S-Class (1979-1992). Detailed Installation Manual with Special Connectors – Easy DIY installation. Heavy Duty Flip Key Remotes – Keys will need to be cut at a locksmith. 3 Remote Auxiliary Outputs – You can add other accessories. Vacuum / Infra Red Compatible – operates your central locking without any additional parts. 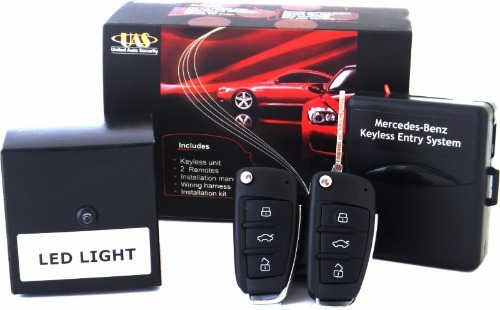 2 Flip key remotes with Mercedes-Benz key blanks. This is an aftermarket system built for your Mercedes-Benz vehicle. United Auto Security is not affiliated with Mercedes-Benz.